How A Texas Postman Became An Hermès Designer Kermit Oliver works for the U.S. Postal Service. 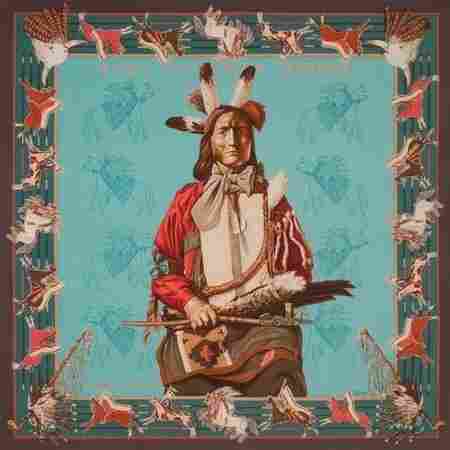 He's also the only American artist to ever design scarves for Hermès. As writer Jason Sheeler got to know Oliver, the story only got bigger. "As a matter of fact," the woman told Sheeler, "he is a postman." Several weeks and many voicemails later, Oliver finally, reluctantly, allowed Sheeler to visit him at home. Sheeler, who wrote about Oliver in the October issue of Texas Monthly, tells Guy Raz, host of weekends on All Things Considered, that he was immediately struck by Oliver's artwork. "Every single bit of wall space is covered with incredibly beautiful, colorful paintings," Sheeler says. Most of them are portraits of children or farm animals. One huge painting showed a cat sitting on the back of a cow wearing a floral necklace. Another was a portrait of Oliver's father sitting astride a horse. Oliver is 70 years old. He wears his mustache trim and neat. And though he's one of the most important living African-American painters, he just doesn't understand what the fuss is about. Never mind that he's the only American artist ever to design a scarf for Hermès — which he's done 16 times. Again, he's also an employee of the U.S. Postal Service. "He doesn't believe he can make a living as a painter," Sheeler says. "He doesn't even believe that he's that good — those are his words. He just likes to paint. "He works overnight at the post office, comes home, paints a little bit, takes a nap and then does it all over again. He survives on two to three hours of sleep. Eats a sandwich on his break at the post office. He gets a 30-minute break, and then he goes back to sorting mail." "I think that he's a mystery to everyone. I even sometimes ... wonder if it's a mystery to Kermit, because I think he enjoys people" says Shelby Marcus. Marcus is the wife of Lawrence Marcus, the founder of the legendary Dallas department store Neiman Marcus, which was instrumental in bringing Oliver to the attention of Hermès. "He's private, that's the only thing that I can think of," Marcus says. "He has a need for privacy." 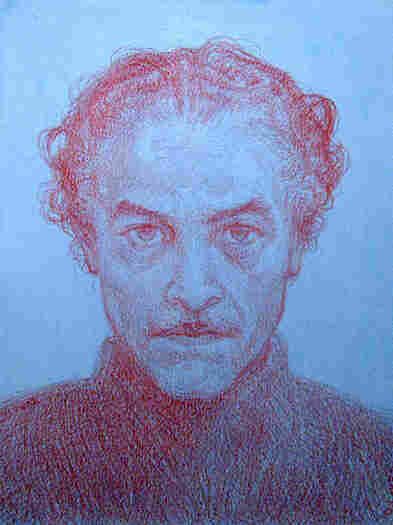 Oliver went to art school at Texas Southern University in Houston in the late 1960s. Almost immediately, his work stood out. "His art is colorful. He works with very, very, very rudimentary supplies," Sheeler says. "He works with acrylic paint that he gets at Michael's [craft stores]. He works on very cheap watercolor paper. He draws, and then he paints. Oftentimes, he uses his family members in his paintings." A gallery in Houston recognized Oliver's talent and mounted a one-man show of his work in 1970. He became the first black artist represented by a major gallery in Houston. That's how Oliver first met Shelby Marcus — and later, her husband. 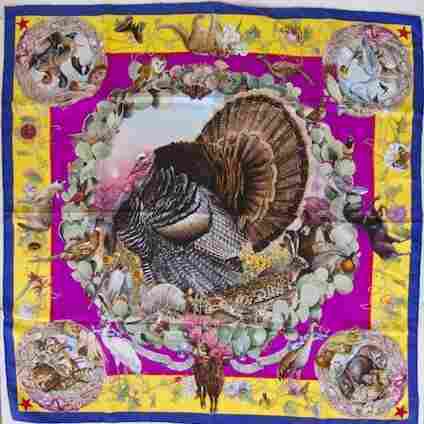 "The Hermès company was looking for an artist to do a scarf with a Southwest theme," Sheeler says, "And Lawrence Marcus said, 'You know what? I know the guy. I've got the guy for you.' "
"The thing that intrigued me and made me think of Hermès, for using Kermit's talent was the fact that Kermit tends to design from the outside in," Lawrence Marcus says. "In other words, he designs the frames of the pictures that he's painting. And that's the way Hermès has chosen its path and it just fit in to what Kermit was doing." By this point, Oliver's work was selling for tens of thousands of dollars. One of his paintings sold for more than $70,000. And all the while, he shows up at the post office in Waco to sort mail. Oliver's story took a tragic turn in 1998 when his youngest son, Khristian, was sentenced to death for beating a man to death during a home robbery. Oliver tried, in vain, to have his son's sentence commuted. Hermès and the Marcus family helped him set up a legal fund. He spent hundreds of thousands of dollars on lawyers, but the sentence stood. In November 2009, Oliver and his family watched as Khristian was put to death by lethal injection. According to people who know Oliver, he was never the same after that. "He became even more reclusive," Shelby Marcus says. "I believe he had some searching to do within himself about his religion, because he was so crushed." "There was no common thread within his family that would lead one to believe that Khristian wouldn't have taken the same path as the other children," she says. "His faith has shifted," Sheeler says. "He'd definitely lost his faith, lost his way in the world, and at the same time having to go to the post office every day. And at the same time having to create these incredibly luxurious 410 squares of silk that are sold in exclusive boutiques worldwide."